BRIGHTON, Mich. - Technology that makes your vehicle more safe and fuel efficient is sprouting up daily and changing the way the industry makes cars. Every day brings us closer to a car that could ultimately drive itself or not use any fuel. While there are certain features that haven't even been thought of yet, here are 5 features that could be on your future car. Collision warning and automatic braking is the first feature that will most likely exist in future vehicles, as it prevents your car from colliding with objects around you. Whether it be a braking vehicle, standing pedestrian, or a tree, this system would alert you and either stop the vehicle, or slow it down. According to the Insurance Institute for Highway Safety, the collision warning alone reduced crashed by 7 percent in vehicles that currently have the system installed - adding the automatic braking would only help decrease the amount of collisions on the road. Automotive cameras are already appearing in vehicles, and are expected to be mandated by law before 2015. These cameras won't only be put in the rear to spot objects behind the vehicle, but will also be used to spot obstacles while turning; give the driver a bird's eye view of the surrounding area; or even be used to spot large animals! 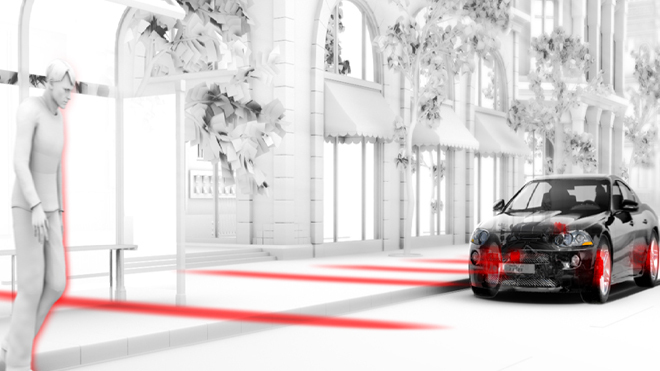 Lane centering technology is another feature that could be on your future car. The Ford Fusion and Ford Explorer currently offer the lane centering technology, but it is expected to be automatically included with future vehicles. This system nudges drivers if they stray from their lane, by sounding a beep or vibrating the driver's seats. The fourth feature that is expected to be on your future car is adaptive headlights. This feature would be extremely helpful for drivers, as it would allow lights to swivel as you turn and help you see around corners. These lights would also be able to sense if there are cars coming and automatically dim. Adaptive lights would make being blinded by oncoming traffic lights, a think of the past. By 2025, it will be required that all vehicles sold in the U.S. will have to average 54.5 mpg of gasoline. In order to make this happen, most vehicles will have to have a stop-start device that shuts the engine off at stops and turns it back on when the brake is let go. This technology already exists in Europe, and in some hybrid vehicles in the U.S. However, it will have to be in all vehicles to get that kind of fuel efficiency. These 5 features that could be on your future car are great resources to have for your driving experience. Not only will this make driving safer, it will also make riding in the vehicle more enjoyable. However, Ford currently has numerous features already installed in its vehicles that make the ride a great one. If you'd like to check out what Ford has to offer for you and your vehicle, stop by our Wixom Area Ford Dealership and let us help you into a New Ford Truck or one of our Ford Cars For Sale.